In her brand new, beautifully designed style guide, TV star, fashion designer and New York Times bestselling author Lauren Conrad reveals her absolute must-haves for any fashionista's wardrobe with her top tips for creating your own gorgeous style without breaking the bank. This ultimate style guide contains Lauren's favourite looks, beauty advice and info on everything you need to travel in style. 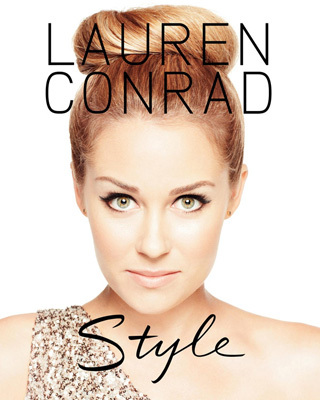 With never-before-seen full colour photos of Lauren and her recommended fun and flirty outfits, Lauren Conrad Style is the perfect book for LC fans and anyone looking for inside fashion advice from one of Hollywood's most relatable to, yet glamorous, stars. Lauren Conrad was the star of MTV's #1 show The Hills. Her first novel, L.A. Candy. is a #1 New York Times bestseller. She has been featured on the covers of Cosmopolitan, Rolling Stone, Seventeen and Entertainment Weekly, among others. She lives in Los Angeles. Review: This is a beautiful hardcover book filled with amazing pictures and commons sense fashion tips. Lauren Conrad is a style icon whose simple and classic style is admired worldwide.